If the seconds hand on your Oakley "Timebomb" Kinetic watch is moving two seconds at a time. Replacing the capacitor alone will not rectify the problems you're having with your watch. We will fully service your Oakley "Timebomb" watch, with a comprehensive warranty (as above); this will give your watch many more years of extremely high accurate timekeeping. We disassemble the movement and ultrasonically clean all the parts, then we inspect them and replace any that are worn with genuine Seiko parts. We always fit a “New Seiko Cell Kit”, which are fitted in Seiko new kinetic watches (Titanium Carbon Lithium Ion), whether it was the old obsolete capacitor or newer type cell. We pressure test to the original pressure. Sorry we are unable to get any case or bracelet parts now, including the glass. Diagnostics and more detailed information on the above. 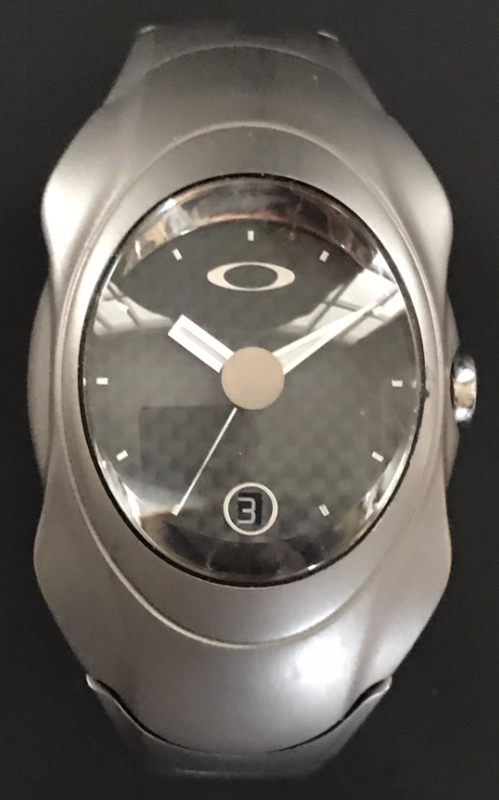 This fixed price service is for a Oakley "Timebomb watch", in reasonable condition and not badly water damaged. If you would like us to Fully Service and Repair your Oakley "TimeBomb" Watch for you.